I plan to print this eGiftCard, and I would like it sent to my email address. GlobalGolf eGiftCards are quick, easy, and always appreciated. An eGiftCard can be emailed to your recipient for immediate shopping, it can be scheduled to arrive on a special day, or it can be emailed to you, should you prefer to present your gift in person. GlobalGolf eGiftCards are valid for whatever your golfer desires at GlobalGolf.com. 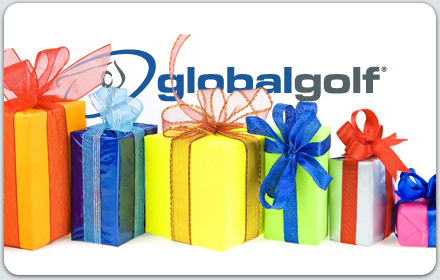 * GlobalGolf eGiftCards never have additional fees, and they never expire. A GlobalGolf eGiftCard is precisely what your golfer wants. Every time, guaranteed. If you need assistance creating your new eGiftCard or checking your existing eGiftCard balance, please contact GlobalGolf Customer Service. GlobalGolf eGiftCards are issued in US dollars. Promotional Discounts or Coupons cannot be used to purchase GlobalGolf eGiftCards. eGiftCards cannot be returned or exchanged. Redemption instructions are included with all eGiftCards. *Anything, except another GlobalGolf eGiftCard.